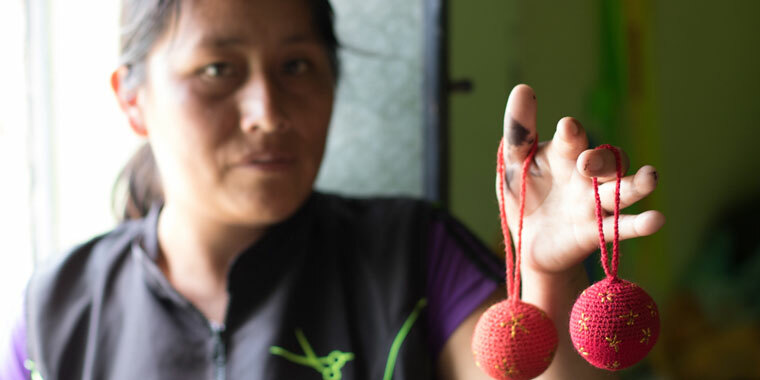 In Ayacucho, Peru, a group of entrepreneurial women are changing their future using inherited knowledge as a source for a better future. Reina Quispe, 32, has lived in La Oyada, a community on the outskirts of the city of Ayacucho, for 15 years. She is a gifted and audacious entrepreneur. 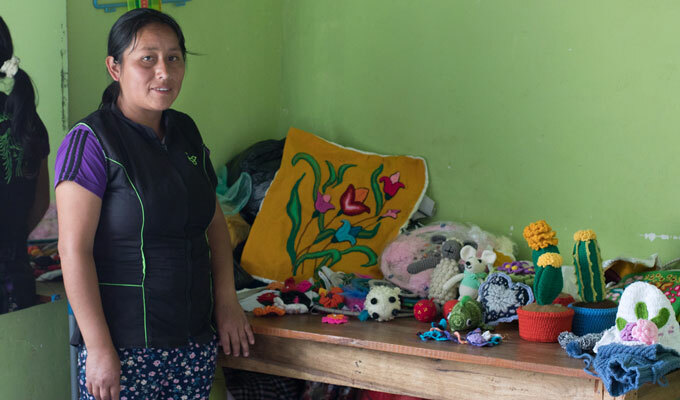 Reina is part of the ‘Women knitting their present and future’ entrepreneurship project SOS Children’s Villages leads in three communities in Ayacucho. 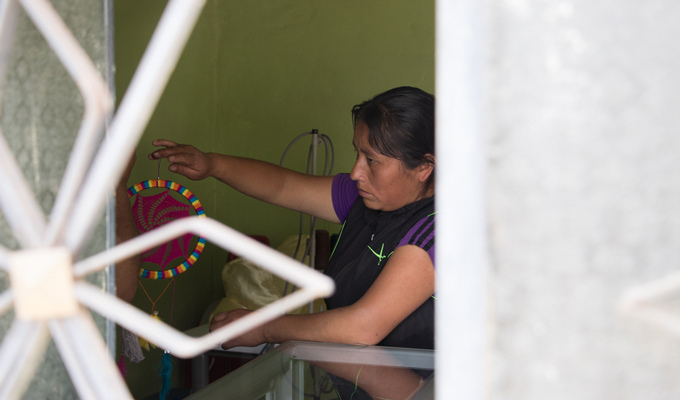 The project responds to the need of mothers to increase their sources of income. Women in the community tend to be at home, raising their children, while the men go out to work. Some of the women are single mothers who raise their children on their own. This leaves them with few opportunities to earn their own money. Most women in Ayacucho learned to knit and weave from their mothers. So did Reina, but she was not as skilled as her sister. But one day an opportunity to knit 300 Christmas ornaments arose. She was a young mother and had to provide for her family, so she accepted the challenge – with the help of her sister. At that time, Reina had her own beauty salon at home. She had taken courses in cosmetology and worked at a salon for a few years before starting her own small business. But she needed additional work to be able to give her children a good education. Reina found out about the entrepreneurship project through the SOS family strengthening team. She attended workshops on topics such as positive parenting, child rights and family life at the local community center at the time. But Reina did not only need guidance with her children, she also needed help to find new ways to earn a living for herself and her family. When Sandra told her about the textile production entrepreneurship project, she decided to join. “Many mothers weave and embroider but do not use this art for commercial purposes. They do not have the techniques to become commercialized,” says Sandra. The project helps the women realize that their ancestral crafts can be a building block for a better life for their families. Additionally, it can empower women so they can build their self-confidence, become leaders in their communities and live in more equal relationships with their husbands. The women in Reina’s community named their working group ‘Duas Hamusta’ – ‘Making dreams come true’ in Quechua. The entrepreneurship project has allowed these women to dream big. 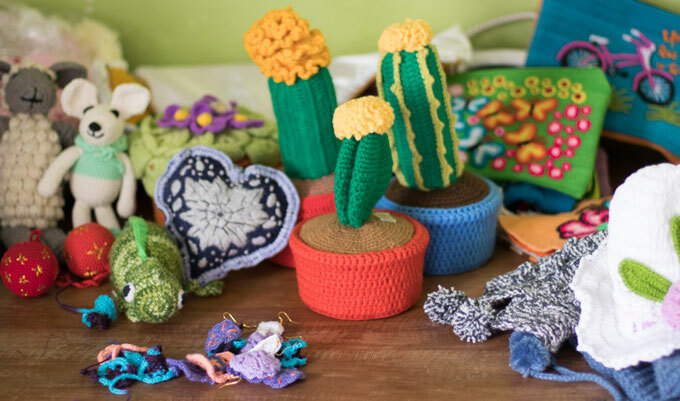 Since June 2017, the SOS team teaches the women how to improve their knitting skills and how to make other products alongside the traditional blankets and skirts. SOS Children’s Villages provides the working tools, such as wool, yarn and knitting sticks. The products are then offered to a government craftsmanship project that promotes the work of local artisans at trade fairs and explores national and international markets to sell the traditional products. Reina has now taken the lead of the ‘Duas Hamusta’ group and hopes, in the future, to have a joint business with the women in La Oyada , so together they can compete with bigger enterprises and take on more ambitious projects.